It stands in an open field in North Ronaldsay that slopes to the sea, down from the Old Kirk with its fine belltower, and you can stand in its lee in the wind and the sun and look out across the water to other islands in the distance. It’s a slab of stone about 13 feet high, with a small hole through it, and it’s now clear that it holds clues to the Orkney of 5,000 years ago. A parish minister recorded that, up until the early 1700s, people used to gather at the stone to dance on the first day of the year to dance by moonlight – ‘with no other music than their own singing’. The time of year is interesting, as the stone seems to have been shaped with a midwinter connection. On the shortest day of the year, the setting sun shines directly through the little hole. Stones of this type can be found elsewhere – with traditions as well. 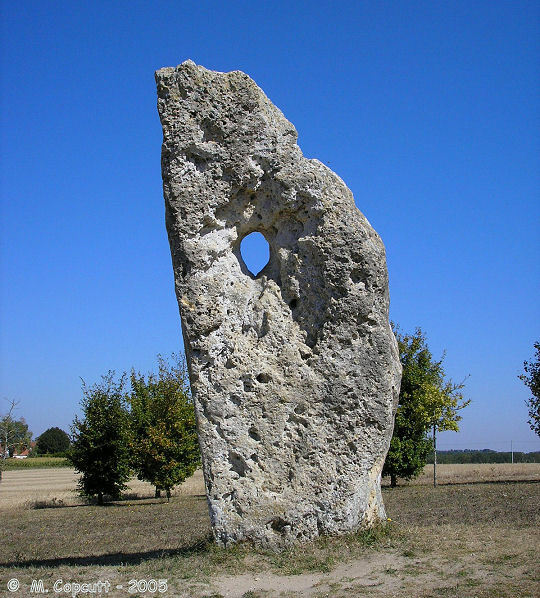 One such stone is in the French province of Touraine and called the Menhir des Arabes. (Menhir comes from a Breton word formed from ‘long’, hir, and ‘stone’, men.) The story of its use was told to the Orkney Antiquarian Society during its season of 1925-26 by Mr Ronald Mooney of Kirkwall, who had been to see the stone for himself. 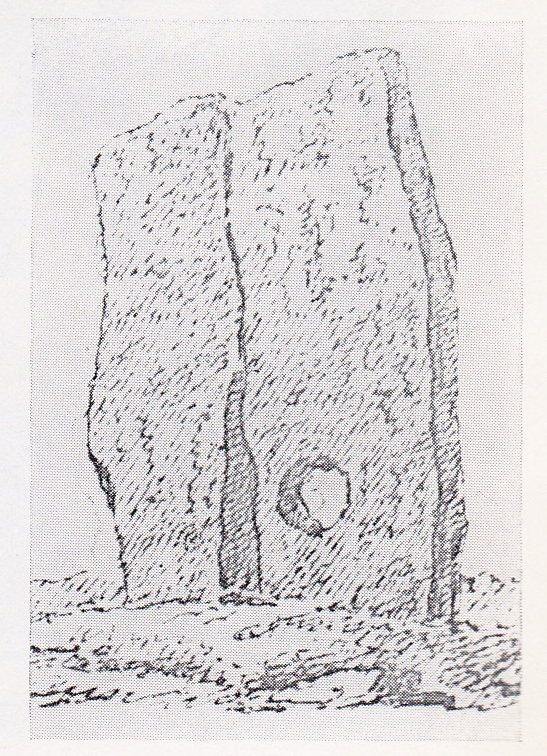 The interest for Mr Mooney and his listeners came from the Menhir’s similarity to a stone that had once stood on the Orkney mainland, at the Brig of Brodgar in Stenness, close to where the Watchstone still stands today. Up till 1814 there was another stone directly across the road from it – the Stone of Odin. This stone had a hole, big enough for a couple to reach through and join their right hands together. And they did this “upon the first day of every new year”, according to the minister of Greyfriars Church in Edinburgh, Mr R. Henry, who visited Orkney in the late 1700s. The custom had died out some 20 or 30 years ago, he reported, but what was involved was on quite a scale. The phrase ‘proceeded to Consummation’ makes quite clear that this was a form of marriage, which we know from accounts elsewhere was once widespread across the British Isles. It was called handfasting, and it was one of several older forms of marriage that had survived into the Christian era by being developed into a system of trial marriage. With divorce not allowed and with the need to discover if a bride could become pregnant, systems of trial marriage emerged, such as marriage at the church door with the full marriage itself then taking place inside the building at a later date. What put a stop to these customs was the 1754 Marriage Act which defined marriage by law for the first time, and ended such customs as jumping over a broomstick together in front of two witnesses. That date fits precisely with the accounts of the decline of the custom at the Stone of Odin as quoted by Ker and by Mr Henry, who writing in 1784 said that the custom had ‘entirely subsided within these 20 to 30 years’. But what is remarkable is how long it did last, through years of strict Presbyterianism, times when families would split and men go to war over the detailed form of Church doctrine. The buildings which through the year resounded to the Sunday sermons were happily opened up at the New Year for the young people to enjoy several days of ‘dancing and feasting’ – with trial marriage thrown in. There was a further distinctive feature of the handfast marriages in that there was a way of ending them and taking another partner – as Mr Henry’s report goes on to explain. There is an account from Ireland with striking similarities. It was written in 1836 and describes the tradition of handfast marriages at a great annual fair at Tailtiu (in English, Teltown) in County Meath. In a hollow on the site, called Laganeeny, was a wall with a wooden gate in it, with a hole in the gate big enough for a human hand to pass through. A subsequent writer described the way of ending the marriage. The couple would stand back to back on a nearby earthen fort and walk away from each other – just as in the kirk of Stenness. The similarities with the Irish and Orkney traditions are so close that they clearly come from a common tradition. But the Orkney stone was called the Stone of Odin, which suggests a Norse connection – yet handfasting is unknown in Norway. So for Norse people coming to Orkney and seeing the custom of handfast marriages and hearing the story of Lugh, their natural way of expressing it would be in the language of Odin. And indeed we can find what may be an echo of the name of Lugh at several stones. There is a mention of a stone Loe at Campston in Toab. And in Caithness in the parish of Bower there is the Stone Lud, interpreted by some as the grave of a Norse earl Ljot but clearly a Neolithic standing stone from long before the Norse era. But why should a custom for a Celtic god have become embedded in ancient Orkney? The broch towers give a clue, in high prominent positions, dominating bays and headlands, looking out across the water. They are the signs of a military strength, and we find them on the northern and western seaboard of Scotland, on the great seaway that reaches down to the Irish Sea and south to Iberia and the Mediterranean. The dates of the first broch structures go back to the 7th century BC, a time when the rapid spread of iron technology was changing the world, opening up new possibilities for shipbuilding, farming, manufacturing and trade. We find various similarities with the brochs and customs from ancient Scotland and Ireland. For example, from the site of the Broch of Burwick in South Ronaldsay there is a stone with footmarks – now in the Burwick kirk. Such a stone was used in ancient Ireland for the coronation of a king. He stood on the stone, which was said to recognise the rightful king. We find stories passed on by George Marwick of Yesnaby, who was born in 1836. He wrote of old traditions of a dispute between the rulers of two brochs – Borwick at Yesnaby and Verran at Voystown, and each was called a righ – the Irish word for ‘king’. We also find Gaelic roots in some Orkney place-names – Cantick Head in Walls and the farm of Cannigall near Scapa are from Gaelic ceann (‘head’), and Knucker Hill in Westray is from Gaelic cnoc (‘hill’). Hugh Marwick, who made these derivations also regarded Himera Geo in North Ronaldsay as possibly taking its name from Gaelic iomair, ‘a ridge of land’. A very few words in Orkney dialect have Gaelic origins, including keero for the native North Ronaldsay sheep; caora is the word for a sheep in Irish and Scottish Gaelic. But remarkably there are in various parts of Orkney – and noticeably in North Ronaldsay – place-names in another form of Celtic, that has developed elsewhere into modern Welsh. Twinyes in North Ronaldsay – the site of the bird observatory – has its origin in the word found in Welsh today as twyn, a point. The Old Norse word nes which has been added to it means the same thing and so has doubled it up. There are other examples of the name in Westray, Shapinsay and St Andrews. Turrieness Hill in North Ronaldsay has its origin in the word twr, a stack or hill. The origins of the name of the farm of Trebb may be the word that appears in Old Irish as treb (‘homestead’), and Welsh tref (‘a settlement’). In Welsh tradition there is a figure that parallels the Irish Lugh so closely that it is clear they come from a common origin. This is Llew Llaw Gyffes, ‘Llew with the steady hand’. And he is connected with a standing stone – in the following way. Welsh traditions tell how Llew’s wife fell in love with another man, Gronw Pebyr, to whom she revealed the secret of killing Llew. This involved Llew standing at a particular place, and when he did this, Gronw hurled a spear at him. Llew flew up in the form of an eagle, giving a fearful scream, and was seen no more, and Gronw took over his land. But Llew’s uncle, Gwydion, who had brought him up, searched for him, and one day found a sow eating something below a tree. Gwydion turned Llew back into human form and he was a sad sight, being nothing but skin and bone, but with the help of good physicians he was healed before the end of the year, and an army went to deal with Gronw, who sought terms. Llew told him that he had to stand at the exact spot where he himself had been when Gronw’s spear pierced him and receive a return blow. Gronw had one request. Since he had been lured into his actions by a woman’s wiles, could he at least put a slab of stone in front of him? Llew agreed, and Gronw put the slab in place. So here we have two rivals, each ruling the same territory, with the transfer of power coming when a spear goes through a hole in a stone. The question now is: is the relation of Llew to Gronw that of one half-year to the other? And is the spear through the stone that kills Gronw a shaft of midwinter light? And what can we make of the transformation of Llew into an eagle, with putrid flesh falling down to earth from what seems be his former body? This is particularly interesting when we think about the Tomb of the Eagles in South Ronaldsay, where the human bones in the tomb show evidence of having been outdoors for a time and part of a pattern found in various parts of the world whereby the bodies of dead people are left in the open for wild birds or animals to eat, in a transformation that takes them into the form of the creature from which the clan believe they are descended. 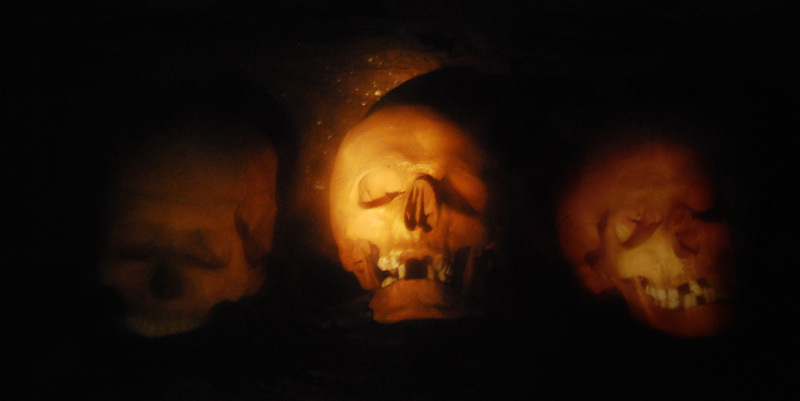 The finding at the tomb of skeletons of sea eagles and necklaces made from their talons suggests that these birds are the totem of the clan, the ancestors into whose bodies they return at death – and from where they may come back into the world in future. There are so many further questions, for instance about other possible alignments in North Ronaldsay and how they may connect with the stone, and what may be found in the various island place-names. But the stone gives us a starting-point from which the questions can be shaped. 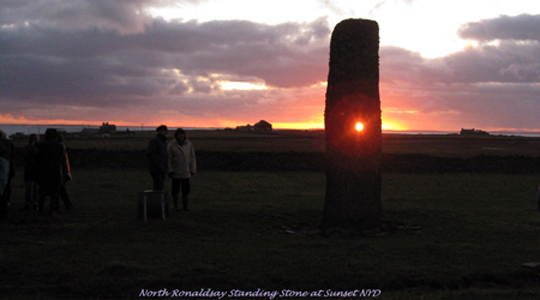 With the body of material that we can build around it, together with its own special midwinter solstice alignment in its island setting, it has to be one of the most remarkable standing stones in northern Europe. Photos of the North Ronaldsay stone by Marion Muir and Gerry Morris.